In the 19th century, the theory of nullification, and the crisis it provoked, was all about states’ rights. Nullification advocates argued that the constitution was a compact between sovereign states, and therefore states could choose to ignore federal laws that they considered unconstitutional. The Civil War largely put an end to this clash, but in the 21st century there’s a new theory of nullification. This one, though, isn’t about a conflict between states and the federal government. It’s about a conflict within the federal government. 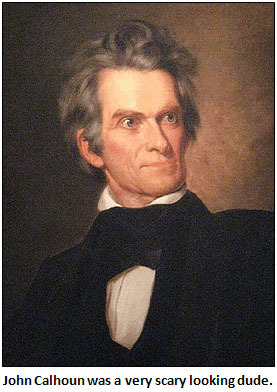 There isn’t yet any modern-day John Calhoun to articulate this new theory of nullification in detail, but the nickel version is pretty simple: it says that a single senator can nullify a duly passed statute of the United States. In one sense, this is just the latest front in the Republican war against executive branch nominees of the Obama administration. But until now, that war has been merely an escalation: more nominees are being filibustered than ever before, creating logjams in the federal court system and a shortage of leadership in the executive branch. It’s a big problem, but nothing has actually been shut down because of it. That’s now changing. Republicans are refusing to allow votes on President Obama’s nominee to head the new Consumer Financial Protection Bureau and on his nominees to fill vacancies on the National Labor Relations Board. In both cases, the Republican refusal is explicity aimed at shutting down these agencies. In the case of the CFPB, it’s because the law that created it gives certain powers to its director, and without a director those powers can’t be exercised. In the case of the NLRB, it’s because they can’t function at all unless a minimum of three out of five seats are filled. When Craig Becker, already a recess appointment because of a Republican filibuster last year, finishes his term at the end of 2011, only two seats will remain filled and the NLRB will grind to a halt. Republicans make no bones about why they’re doing this. They opposed the CFPB from the start, and they’re now using the filibuster as a way of unilaterally preventing it from operating even though it was lawfully created by a vote of Congress and signed into law by the president. Likewise, they’re afraid the NLRB is about to make some rulings they dislike, so they’re using the filibuster as a way of shutting it down by denying it a quorum. Since, in practice, a single senator can place a hold on a nominee, this means that a single senator is now able to shut down an entire agency of the federal government simply out of dislike for what it’s doing. fight it out in court. Or, as Theodore Roosevelt did in 1903, he could make a series of recess appointments in the minutes or seconds between adjournment of the current session and the opening of a new one on January 3rd. Is Obama likely to do either of these things? Pundits and bloggers love to chew over these kinds of unconventional possibilities, but Obama himself has shown little appetite for them. There are probably two reasons for this. First, he’s afraid that Republicans would become even more obstructionist than ever if he went down this road. Second, he’s unsure how the public would respond to this kind of hardball. The former has probably become less salient over time, given that there’s not an awful lot more obstructionist that Republicans can become at this point. But at the same time, the latter has become more salient because there’s an election coming up. So although the liberal base would love to see Obama show more spine on the appointment front, he probably won’t. Obama has consistently ignored his base in favor of the independents he needs to win reelection, and he’s consistently demonstrated that he thinks independents are put off by partisan confrontation. But if that’s the case, it’s likely that our modern-day nullifiers will win by default. John Calhoun would be proud.